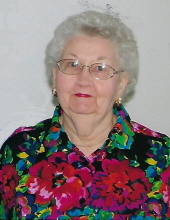 Thelma Lorraine Ditto, the daughter of Glenn and Ruth (Beers) Scott was born February 25, 1923, at her parents’ home in rural Audubon County, Iowa and died April 2, 2019, at the Manning Plaza in Manning, Iowa at the age of 96 years, 1 month, and 7 days. Lorraine was baptized and confirmed at the Lone Star Presbyterian Church. Lorraine grew up in Melville Township, attended rural school and she was just lacking 3 months from graduating from the 8th grade when they moved to a farm east of Hamlin, Iowa. Lorraine attended the Audubon High School graduating with the Class of 1941. During high school she dated her husband to be, Glen Ditto, whom she had met at the Lone Star Presbyterian Church. After graduation Lorraine lived with her parents. Glen worked for a few farmers until he was drafted into the U.S. Army in 1942. Glen was stationed at Camp Carson in Colorado Springs, Colorado. While on furlough he came home to the farm and when he returned to Colorado Springs, Lorraine returned with him they were married on January 9, 1943. They were blessed with three children Leon, Linnet, and Elden. They lived in Colorado Springs for one year then were transferred to Camp Butler in North Carolina. Glen was shipped overseas and Lorraine returned home to her parent’s farm east of Hamlin. Glen was honorably discharged on February 6, 1946, and returned to his wife’s family farm where he met his 4.5 month old son, Leon. Glen and Lorraine purchased a farm in Union Township, Guthrie County where he had grown up. Lorraine helped Glen operate the farm for over 30 years growing row crops, raising livestock, and being a home maker for their three children. Lorraine was a stay at home mom, but did work for a short time for Garst sorting corn and as a detasseling checker. They sold their farm and Glen built a home in Audubon where they resided for over 30 years. Glen and Lorraine enjoyed traveling with their trailer to Texas and Arizona in their retirement years. Lorraine especially enjoyed visiting Leon and Paulette in Wisconsin and going to garage sales and admiring the leaves in the fall. In 2006, Glen and Lorraine sold their home in Audubon and moved to an apartment in Manning to be closer to their daughter, Linnet. Glen fell and broke his hip in their apartment a year later and entered into the Manning Plaza in May of 2007 and died there in December 5, 2014. Lorraine remained in their apartment until October of 2017 when she moved to Char Mac, the assisted living in Manning.. When the Lone Star Church discontinued their services, Glen and Lorraine joined the First Presbyterian Church in Audubon where they remained members until their deaths. Lorraine was active member of the Dorcas Circle at the Presbyterian Church. Lorraine enjoyed embroidering and growing African violets. She really enjoyed watching her grandchildren and great-grandchildren participating in their many activities. Lorraine was preceded in death by her husband, Glen Ditto; her parents, Glenn and Ruth Scott; her brothers, Dalton and Arnold; her sister, Naomi Stengard; her sister-in-law Gladys and husband Vivian Cretsinger; her brothers-in-law Floyd and wife Doris Ditto, Wilbur Ditto, and Warren Bowman; her niece Velma and husband Robert Hagman; her nephews Vaughn Bowman, Darwin Stengard, and Richard Stengard. Survivors include her children: Leon and wife Paulette Ditto of Carroll, Iowa, Linnet and husband Robert Nissen of Manning, Iowa, and Elden Ditto of Anita, Iowa; her 5 grandchildren and her 12 great-grandchildren; her sister-in-law, Wilma Bowman of Audubon, Iowa; nieces, nephews, other relatives and friends. The family will meet with friends Saturday morning April 6, 2019, from 9:00 a.m. until the time of the service at the First Presbyterian Church in Audubon, Iowa. Funeral services will be conducted by Pastor Kelley Pedersen Saturday morning at 10:30 a.m. at the First Presbyterian Church in Audubon. Interment will be in the Maple Grove Cemetery in Audubon. The casket bearers will be Darren Ditto, Trent Nissen, Donovan Ditto, Tom Anderson, Riley Anderson, Mitchell Rohe, Tim Rohe, and Mason Rohe. To plant a tree in memory of Thelma Lorraine Ditto, please visit our Tribute Store. "Email Address" would like to share the life celebration of Thelma Lorraine Ditto. Click on the "link" to go to share a favorite memory or leave a condolence message for the family.